Regular oral exams and cleanings help to keep your teeth and gums healthy. Even if you feel that you are taking care of your teeth well, you should still come in regularly. What Happens at Your Dental Appointment? Next, you will meet with your dentist who will go over your overall oral health with you. He or she will look at the following areas. Why Are Regular Exams and Teeth Cleaning Important? It is vital that you come in as often as your dentist recommends. Your dentist will be able to catch small problems before they become larger issues. Regular cleanings get rid of that harmful tartar buildup that can eventually lead to cavities. Your exam time also gives you a chance to ask your dentist any questions that you have. How Often Should You Have Dental Checkups? The majority of individuals should have oral examinations and cleanings every six months. However, some people, such as those who are dealing with acute or chronic problems, should come in more frequently than this, such as every three months, so that we can keep an eye on any ongoing problems. An oral examination is about more than just cleaning the teeth, although this is an important step. Your dentist will be looking at the overall health of your entire mouth. Frequent appointments are vital for catching problems that may not be easily visible, like periodontal disease or possible cancer growths. It’s important to choose an experienced dentist that you’re comfortable with. She or he might be taking care of your teeth for decades! 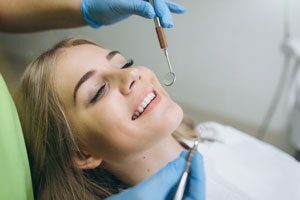 By choosing a long-term dentist, you’re securing your own health: when you see a dentist twice a year, they will be able to notice any small changes or potential problems. If you’re looking for a long-term, dedicated dentist, contact New Image Cosmetic & Family Dentistry today. We would love to schedule a consultation for you!